Only eight Lutheran High Schools existed in the United States in 1943 when Mt. Calvary Lutheran Church in Denver presented its plan for a Lutheran High School to the newly formed Denver Lutheran Council. It was hoped that a representative group of congregations would bring Lutheran secondary education to the Mile High City. The Executive Board of the Denver Lutheran Council appointed a committee of three pastors, two elementary school teachers, and nine laymen to meet at St. John's Lutheran in Denver on February 6, 1944. They recommended that a Lutheran high school association be organized as soon as possible. After years of failing to advance the notion of an association of churches and opening a high school, the Colorado Lutheran High School Association was formed on January 6, 1953. A ten acre farm was purchased in November of 1953 at 3201 W. Arizona Ave. in Denver for $35,000. "It's coming alive in '55" became the slogan as founding Principal, Dr. 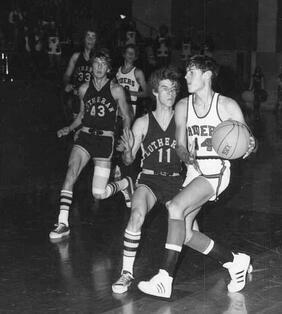 Norm Brinkman, opened Lutheran High School for its first year of classes in the fall of 1955. Only temporary buildings, including a little, white house, which is still on campus today, served as the classrooms and school library. Enrollment on the opening day was 49 freshmen and 28 sophomores. Tuition was $15 a month for Lutheran students and $300 a year for all others. Rev. 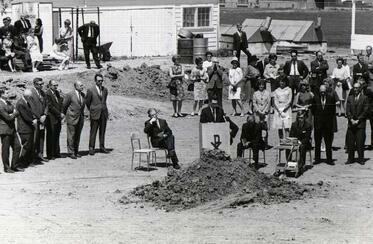 Oswald Hoffman, Lutheran Hour Speaker, delivered the message at the cornerstone laying ceremony. Early in the first semester, navy blue and gold were chosen as the school colors and "Lights" was chosen as the mascot - derived from Matthew 5:16. Twenty-eight graduates received their diplomas at the first commencement in 1958, and Lutheran High School became accredited by the State of Colorado in 1961. A second wing to the school building was completed in 1959 and a third wing was added in 1963. Enrollment reached its peak at 512 students in 1974. Lutheran High School become one of the first two private schools to enter the Colorado High School Activities Association. The gym, later known as the "Light House," was built in 1967. The Colorado Lutheran High School Association expanded its ministry and opened two new schools in the fall of 2000. 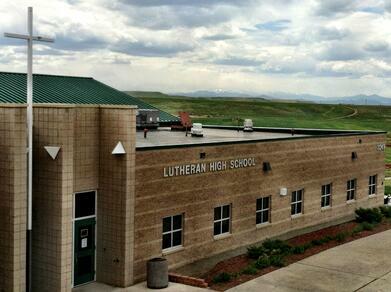 Lutheran High School of the Rockies (later renamed Lutheran High School Parker) began in a strip mall on Parker Rd. under the direction and guidance of Mr. Tim Hipenbecker. The school colors were purple and silver and the students chose "Lions" as the mascot. North Lutheran High School began in rented space in the north part of the Denver metro area. Lutheran High School at 3201 W. Arizona Ave. was renamed "Denver Lutheran High School." 19 million dollars was borrowed in 2004 to see the construction of the Lutheran High School Parker campus at 11249 Newlin Gulch Blvd. and to renovate and add additional space to the Denver Lutheran campus. This investment did not result in increased enrollment for either of the two schools. North Lutheran High School was closed in 2006 due to its inability to meet enrollment projections. The Lutheran Church Extension Fund assisted the CLHSA in refinancing its 19 million of debt to 14.5 million. The communities of Denver Lutheran and Lutheran Parker raised 1.1 million dollars in 30 days to assist the refinancing. With enrollment at the Denver Lutheran High School still on the decline, its campus was sold to Denver Public Schools in June of 2010 for 5 million dollars. The plan was to relocate its operations to the northwest part of the Denver metro area after leasing at its current location for two school years. That plan was re-evaluated shortly thereafter In light of dragging payables, lack of tuition income, debt service, and failure to generate funds. After a long period of wrestling with the future plans for the organization, it was announced in February of 2011 that Denver Lutheran High School and Lutheran High School Parker would be consolidated at the Parker campus for the 2011-2012 school year and the school would be once again known as "Lutheran High School." Each school finished its 2010-2011 school years with 175 students. The 2011-2012 school year began at the Parker campus with 238 students under the theme of "unity," with a new logo, a combined student body, and a combined staff. Lutheran High School is built on the history and tradition of both Denver Lutheran High School and Lutheran High School Parker. The legacy of both schools are honored at the current campus. The school will serve about 200 more students during the 2017-2018 school year than both schools did together in 2010-2011. To God be the glory - He has been good to and through Lutheran High School. This is a community and family that wants its people to thrive. I have been impacted by countless teachers and coaches who have taught me life lessons and demonstrated how to be a Christian example for others to see.